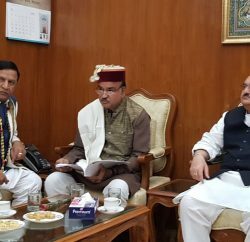 Shimla: Chief Minister Virbhadra Singh appreciated party high-command decision of nominating Viplov Thakur for Rajya Sabha and assured all possible support to her. He was informally talking to the media in H.P Vidhan Sabha premises today after filing of nomination papers by Viplov Thakur for the lone Rajya Sabha seat. Replying to a question, Virbhadra Singh said that pre-poll surveys were manipulated and far from the reality and truth. He said that he wasn’t sure that whether people engaged in survey had actually visited any constituency and even if they had so, it seems that they might have only interacted with very few persons which were not enough to judge the mindset of the voters. Answering to another question regarding imposing ban on pre- poll surveys, he said that such surveys should be banned by the Election Commission of India (ECI) as there remain a scope for manipulation and misuse of money power during such surveys. Virbhadra Singh said that he was pained that a large portion of the historic Accountant General Office got gutted in the wee hours today. 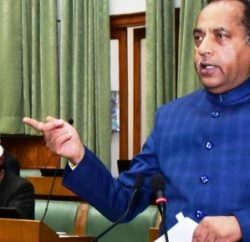 He said that an inquiry would be conducted to know the exact cause of fire and he would also request the Government of India to reconstruct the damaged portion of this building in the traditional style and architecture as this was a heritage building housing Central Government AG Office. Later, Chief Minister visited the damaged AG Office building site. He also held discussion with Accountant General and Officers of the Central Public Works Department (CPWD) regarding the extent of damage and reconstruction of the damaged portion. He said that State Government would provide all possible assistance for its reconstruction. 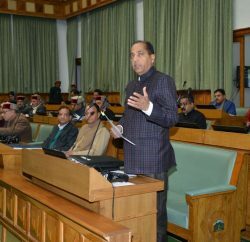 Speaker HP Vidhan Sabha Brij Bihari Lal Butail, Industries and I&PR Minister Mukesh Agnihotri, Excise and Taxation Minister Prakash Chaudhary, Commandant General Home Guards I. D. Bhandari, DC Shimla Dinesh Malhotra, SP Shimla Abhishek Dular and Senior Officers were present at AG Office site.